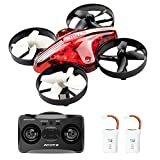 · Altitude Hold: This rc quadcopter is with altitude hold mode, just release the throttle lever, you can precisely lock the height and location, move stably, making the experience Very easy and convenient, even for beginners, you can play this mini drone easily. · Headless Mode: The small drone helicopter can activate headless mode at the beginning of the flight, it is not necessary to distinguish the direction of the drone and can control it more easily.And the Lord LED indicator light, allows you to fly in the dark of the night. · The battery reserve: The product brings a USB charger that takes on average 30-50 minutes for full charge and holds about 6-8 minutes of use, because we have a reserve battery, so total we can enjoy 12-16 minutes flying You can reach a flight distance of more or less 30 meters (More than 30 meters, the drone is easy to lose the control). · Flip 3D function and headless mode make your flight exciting and fun, the very stable drone built. Protected propellers are less risk of cutting and wings are protected so that a few drops won´t damage it.